The McAfee Complete Data Protection suite protects your data using a combination of powerful enterprise-grade endpoint encryption and access control. The suite helps you establish and enforce a data protection policy and centralizes data security management using the McAfee ePolicy Orchestrator (ePO) management console. This suite optionally includes management of native encryption for encryption native to Mac and Microsoft Windows PCs*. Additionally, McAfee ePO Deep Command provides remote security management to access Intel vPro-based PCs to implement patches, reset passwords, and remediate broken endpoints. Protect your data from loss or theft with a blazingly-fast endpoint encryption solution that is FIPS 140-2 and Common Criteria EAL2+ certified, and accelerated by the Intel Advanced Encryption Standard New Instructions (Intel AES-NI). Encrypt storage on desktops, virtual desktop infrastructure workstations, laptops, tablets, and removable media such as CD/DVD and USB flash devices. You control what specific file types and folders are encrypted. Utilize management of native encryption for Mac with Apple FileVault — soon available for Microsoft BitLocker and native to Microsoft Windows. Extend the reach of IT with Intel vPro and Intel Active Management Technology-based platforms for secure remote access, regardless of PC power or encrypted state. Deploy and provision with confidence with the Endpoint Encryption Go utility to ensure your endpoints have passed pre-encryption inspections and on-going health monitoring. Use advanced reporting and auditing capabilities to quickly and easily demonstrate security compliance to internal and external auditors, and other key stakeholders. McAfee Complete Data Protection suite offers drive encryption, file & removable media protection, management of native encryption, and ePO Deep Command. Sensitive data is constantly at risk of loss, theft, and exposure. Many times, the data simply walks right out the front door on a laptop or USB device. Companies that suffer such a data loss risk serious consequences, including regulatory penalties, public disclosure, brand damage, customer distrust, and financial losses. According to a Ponemon Institute report, 7% of all corporate laptops will be lost or stolen sometime during their useful life.1 The rapid proliferation of mobile devices with large storage capacities and often Internet access is opening up even more channels for data loss or theft, so protecting sensitive, proprietary, and personally identifiable information must be a top priority. 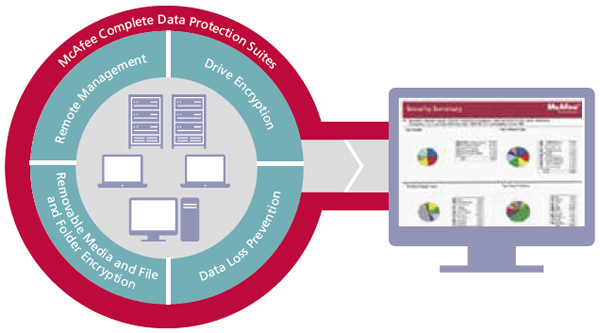 McAfee® Complete Data Protection Suites address all of these concerns and many more. Stop data loss initiated by sophisticated malware that hijacks sensitive and personal information. Secure data when it’s stored on desktops, laptops, tablets, and other mobile devices. Manage Apple FileVault Native Encrypted OS X Mountain Lion and OS X Mavericks endpoints. Communicate with and take control of your endpoints at the hardware level whether they are powered off, disabled or encrypted to halt deskside visits and endless helpdesk calls due to security incidents, outbreaks, or forgotten encryption passwords. Prove compliance with advanced reporting and auditing capabilities; monitor events and generate detailed reports that show auditors and other stakeholders your compliance with internal and regulatory privacy requirements. Manage remote remediation to any PC anywhere in the world with access from the hardware. Conduct resource-intensive tasks during off hours to limit impact to users. Lower IT costs by reducing frequent desk-side visits and lengthy service calls. Decrease PC power costs by adopting a power savings program, but still maintain access for security or patching. Quickly discover and provision Intel AMT by easily identifying Intel vPro-equipped PCs and then enabling Intel AMT for streamlined activation. 1 The Billion Dollar Lost Laptop Problem Study, Ponemon Institute, September 2010. Prevent unauthorized system access and render sensitive data unreadable in the event of device loss or theft by implementing full-disk encryption and access control on all endpoint devices. Automatically and transparently encrypt files and folders on the fly — before they move through and outside your organization. By communicating with endpoints at a level beyond the operating system, ePO Deep Command allows security administrators to configure and remediate hard-to-manage endpoints from a central site, using an established and familiar management platform — McAfee ePolicy Orchestrator. Use a single, centralized McAfee ePolicy Orchestrator (ePO) console to implement and enforce mandatory, company-wide security policies that control how data is encrypted, monitored, and protected from loss. Centrally define, deploy, manage, and update data security policies that encrypt, filter, monitor, and block unauthorized access to confidential data. Monitor real-time events and generate detailed reports that show auditors, senior management, and other stakeholders your compliance with internal and regulatory privacy requirements. Secure your confidential data with an enterprise-grade security solution that is FIPS 140-2 and Common Criteria EAL2+ certified for the Intel Advanced Encryption Standard—New Instructions (AES-NI) implementation. McAfee Complete Data Protection Suites use drive encryption combined with strong access control via two-factor pre-boot authentication to prevent unauthorized access to confidential data on endpoints, including desktops, laptops, USB drives, CD/DVDs, and more. Ensure that specific files and folders are always encrypted, regardless of where data is edited, copied, or saved. McAfee Complete Data Protection Suites feature content encryption that automatically and transparently encrypts the files and folders you choose on the fly—before they move through your organization. You create and enforce central policies based on users and user groups for specific files and folders without user interaction. Management of native encryption v1.0 allows customers to manage the native encryption functionality offered by Apple FileVault on OS X Mountain Lion and Mavericks directly from McAfee® ePolicy Orchestrator® (McAfee ePO™) software. Management of native encryption v1.0 thus provides zero-day compatibility with OS X patches, upgrades, firmware updates from Apple, as well as zero day support for new hardware from Apple. Management of native encryption v1.0 allows administrators to manually import FileVault Recovery Keys where users have already manually enabled FileVault. Use the centralized McAfee ePO software console to implement and enforce mandatory, company-wide security policies that control how data is encrypted, monitored, and protected from loss. Centrally define, deploy, manage, and update security policies that encrypt, filter, monitor, and block unauthorized access to sensitive data. Automatically encrypt entire devices without requiring user action or training or impacting system resources. Identify and verify authorized users using strong multifactor authentication. Automatic, on-the-fly encryption for virtually any mobile storage device, company-issued or not. Access encrypted data anywhere without the need for any additional software installation or local administrative rights on the device host. Keep files and folders secure wherever they are saved, including on local hard disks, file servers, removable media—and even as email attachments without requiring the email recipient to have encryption software. Manage FileVault on any Mac hardware that can run OS X Mountain Lion or Mavericks directly from McAfee ePO software. Enforce a standard password complexity policy on local OS X users. Report compliance in various reports and dashboards in McAfee ePO software. Remotely manage PCs beyond the operating system at the hardware level. Power on and wake up a PC, even if encrypted to execute security tasks. Use the McAfee ePO software infrastructure management to manage full-disk, file and folder, and removable media encryption; control policy and patch management; recover lost passwords; and demonstrate regulatory compliance. Synchronize security policies with Microsoft Active Directory, Novell NDS, PKI, and others. Prove devices are encrypted with extensive auditing capabilities. Log data transactions to record such information as sender, recipient, timestamp, data evidence, date and time of last successful login, date and time last update received, and whether the encryption was successful or not. McAfee Complete Data Protection Suite. The following are minimum system requirements only. Recommended requirements are in parenthesis, where applicable. Actual requirements will vary depending on the nature of your environment. 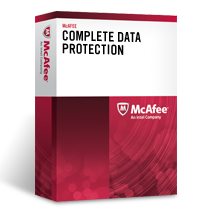 Download the McAfee Complete Data Protection Datasheet (PDF).